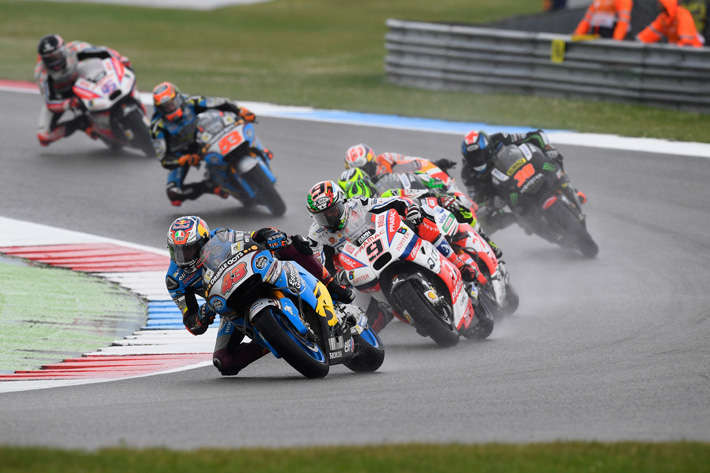 Jack Miller (EG 0,0 Marc VDS Honda RC213V) scored a stunning first MotoGP victory at rain-lashed Assen today, taking advantage of the ever-changing weather conditions to beat the established stars with a perfectly executed ride in a restarted and shortened race. 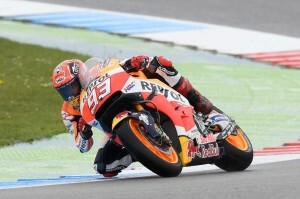 The Australian was followed home by twice MotoGP World Champion Marc Marquez (Repsol Honda RC213V), whose 20-point haul moves him 24 points ahead of reigning champion Jorge Lorenzo (Yamaha), who finished in tenth position. The result was Honda’s third MotoGP victory of 2016 and its first one-two of the year. The 26-lap Dutch MotoGP race got underway on a wet track at the usual 2pm start time, but at half-distance a torrential rain storm hit the circuit, flooding the track and creating a fog of spray that made it too treacherous to continue, so the race was red flagged. A new 12-lap race got underway at 3pm, with the track still wet, but with much less standing water and much better visibility. Former World Champion Valentino Rossi (Yamaha) led the way until he fell on the third lap. Rossi’s exit handed the lead to Marquez, riding fast but taking care not to take big risks that might endanger his points lead, with Miller right behind. Soon the former Moto3 race winner moved ahead of the former 125cc, Moto2 and MotoGP champion. Marquez knew discretion was the better part of valor today, so he didn’t chase his fellow RC213V rider, but followed at a respectful distance to make sure of his third consecutive second-place finish. At the end he was 1.9 seconds down on the winner. Miller’s inch-perfect win was historic for a couple of reasons. The 21-year-old born in Townsville (Queensland) is the first non-factory team rider to win a MotoGP race since Toni Elias won the 2006 Portuguese Grand Prix aboard his Honda RC211V, riding for Fausto Gresini’s team. He is also the first Australian to win a MotoGP race since Casey Stoner won the 2012 Australian GP on his Repsol Honda RC212V. This was Miller’s first GP win since he won the 2014 Valencia Moto3 race. 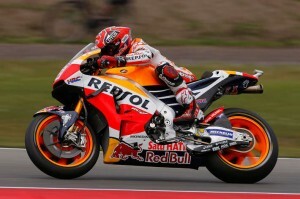 His previous best result in the premier class was tenth at the Catalan GP earlier this month. Understandably, Miller was somewhat emotional after his unexpected victory, which is the culmination of years of hard work. The youngster and his parents Sonya and Peter first came to Europe in 2010 when they lived in caravan parks, while Miller learned his craft on a Honda RS125. 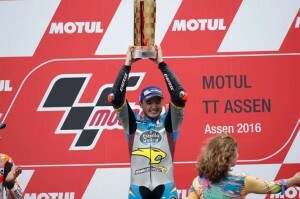 He made his GP debut in 2011, when he also won the German 125cc championship. He started his full-time 125 career the next year. In 2014 he finished second in the Moto3 World Championship behind Honda’s Alex Marquez. 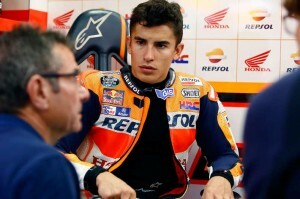 Last year he moved directly to MotoGP with Honda, missing out the Moto2 class. Today’s race was less kind to Honda’s other three MotoGP riders. Tito Rabat (EG 0,0 Marc VDS Honda RC213V) and Dani Pedrosa (Repsol Honda RC213V) fell victim to the tricky conditions, sliding off during the second race. But they were both undaunted and picked up their bikes to restart. 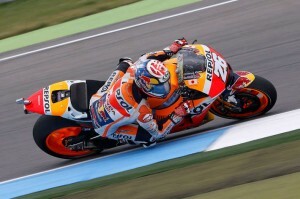 Rabat reached the checkered flag in 11th and Pedrosa in 12th. 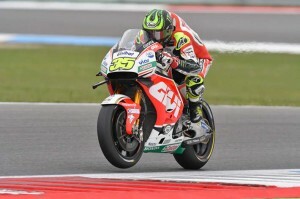 Cal Crutchlow (LCR Honda RC213V), who was a superb fifth fastest in yesterday’s qualifying outing, also slid off but was unable to restart. Takaaki Nakagami (Idemitsu Honda Team Asia Kalex) scored a richly deserved maiden Grand Prix victory in the Honda-powered Moto2 race, which started on a dry track and was red-flagged after 21 laps when the first rain arrived at Assen. The 24-year-old from Chiba is the first Japanese rider to win a GP since Yuki Takahashi won the Catalan Moto2 race in 2010. Nakagami made his GP debut in the 125 class in 2007 and has been fighting for his first Moto2 win since 2012. He got agonizingly close on several previous occasions, taking four second-place finishes in 2013. The Japanese, whose team is run by former Repsol Honda factory rider and 500cc GP winner Tadayuki Okada, grabbed the lead from Franco Morbidelli (Estrella Galicia 0.0 Marc VDS Kalex) shortly before half-distance and quickly set about escaping from the pack. At one point he enjoyed a three-second lead – an eon in a class in which all riders use identically prepared CBR600 engines – and he was 2.4 seconds up when the red flags came out a few laps before the finish. Reigning World Johann Zarco (Ajo Motorsport Kalex) had to work hard to fight clear of the pack and get Nakagami in his sights; but the rain ended any chance he might have had of scoring a third consecutive win. However, his third podium in a row moves him into the championship lead, equal on points with Alex Rins (Paginas Amarillas HP 40 Kalex) but ahead of the Spaniard thanks to his three race wins to Rins’s two. Morbidelli was delighted to take third, his first podium result of the season, three seconds behind Zarco. Sam Lowes (Federal Oil Gresini Moto2 Kalex) and Lorenzo Baldassarri (Forward Team Kalex) enjoyed a thrilling duel for fourth place, swapping positions frequently. Lowes finally got the upper hand by eight tenths of a second. Rins was next in sixth, one of his worst results of the year, and just ahead of Simone Corsi (Speed Up Speed Up). They finish five seconds ahead of the trio that completed the top ten – Alex Marquez (Estrella Galicia 0.0 Marc VDS Kalex), Dominique Aegerter (CarXpert Interwetten Kalex) and Jonas Folger (Dynavolt Intact GP Kalex) – who crossed the finish line separated by just four tenths of a second. Pole-position man Thomas Luthi (Garage Plus Interwetten Kalex) led the first lap but struggled with grip and slipped down the order before finally sliding off without injury. Hugely talented Moto3 rookie Fabio Di Giannantonio (Gresini Racing Moto3 Honda NSF250RW) came within four hundredths of a second of winning his first Grand Prix in today’s Moto3 race, crossing the line three abreast with two rivals in a frantic six-man rush to the finish. The 17-year-old Roman was originally classified as the third-place finisher, just 0.039 seconds behind winner Francesco Bagnaia (Mahindra) but he was soon promoted to second after race officials decided that Andrea Migno (KTM) had exceeded track limits on the last lap and was demoted to third. Di Giannantonio rode his first GP at Valencia last November and this is his second podium result, following his first at Mugello last month. Niccolo Antonelli (Ongetta-Rivacold Honda NSF250RW) and Jules Danilo (Ongetta-Rivacold Honda NSF250RW) were also in the midst of the battle for victory; Antonelli actually taking the lead for the first time on the last lap, but at the flag they were fifth and sixth. The top ten were covered by one second, with Lorenzo Dalla Porta (Estrella Galicia 0,0 Honda NSF250RW) taking tenth place in his first ride substituting for Jorge Navarro, who recently broke a leg. Enea Bastianini (Gresini Racing Moto3 Honda NSF250RW) and Aron Canet (Estrella Galicia 0,0 Honda NSF250RW) were also in the thick of the tightly packed group until they tangled with other riders and fell. The ninth Grand Prix of 2016 – the season’s halfway point – takes place at the Sachsenring, Germany, on July 17.